Up the Creek invites you to come and relax while the gentle breeze blows through the trees as you relax and look over the beautiful mountains of North Georgia. This luxury, 3 bedroom,3 bath log cabin sits overlooking green meadows and long range mountains. The cabin has a bedroom on the main level with a queen size bed, full bath, living room, fully equipped kitchen with upscale appliances, dining room, gas fireplace, SAT TV, and a covered porch with rockers and picnic table. The cabin has a gas grill with side burner. There is an outdoor fire-pit where you can enjoy roasting marshmallow, hot dogs or making s'mores! The master bedroom is on the second level with a king bed, full bath with jetted tub or a shower. There is a private deck off the master bedroom with rocking chairs. In the small upstairs loft is a single bed for a little added sleeping space. There is third bedroom in the finished bedroom with a king bed and full bath,glass covered card table and a kid's play table in the basement. Down by the creek there is a large green meadow where the kids can play flag football, baseball, throw their frisbee, fly a kite or wade in the creek.This cabin is Pet-Friendly! Nearby attractions include hiking the beautiful trails of North Georgia, biking, Antique Shopping, White Water Rafting, Horseback Riding, Scenic Train Rides and the famous Swan Drive In. 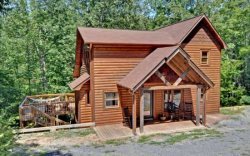 This Blue Ridge, Georgia Mountain Cabin Rental is located approximately 5-8 minutes from Downtown Blue Ridge, GA. Up The Creek is a cabin in the Aska Adventure Area which provides close access to tubing, hiking, biking, Lake Blue Ridge, and the Toccoa River. Aska Adventure Area cabin rentals are in the Toccoa River Valley, which is very close to the Rich Mountain Wilderness Area, USFS, Adventure Trail Rides for Horseback Riding, Blue Ridge Canopy Adventures for zip lining, and the Benton McKaye Hiking trail, which is the largest spur of the Appalachian Trail. We only had one interaction when we called to add a night to our stay. Everything was handled quickly and painlessly in one call. Lovely cabin in a good location close to most local spots. Everyone was very polite and cabin was clean. No surprises. We liked the area and had a beautiful view. Booking this cabin was extremely easy and the check in staff was very welcoming. We really enjoyed this cabin and the location was great. We would come back again. Thanks. We loved the cabin. It was decorated nicely and had all the amenities.